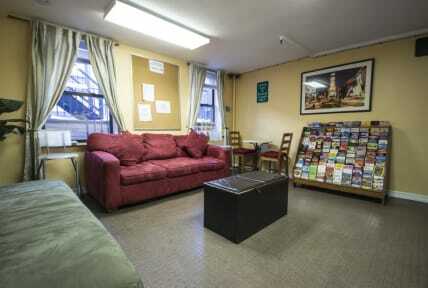 The Chelsea International Hostel is one of the largest independent Hostels in New York City, operating since 1992. We are located in Chelsea, a prime location in the heart of Manhattan. From here our guests can walk to most of the attractions NYC has to offer. Highline Park is only 2 blocks away. Follow the lights and arrive in Times Square after a 15-minute walk. But if you prefer to ride the subway, feel free to hop on any of the many subway lines that serve us (A, C, E, F, 1, 2, 3). You can get virtually anywhere in the city in just a few minutes. Our simple, functional rooms can sleep one to four guests in single beds (in single, shared and private twin rooms) or double-size beds (in private double-bed rooms). We do not use bunk beds in our rooms. Every room is air-conditioned during the summer months. Most rooms will share bathrooms down the hall and the bathrooms are cleaned constantly. Every floor in any of our eight buildings has a bathroom; most of the times there is no waiting in line to use the bathrooms. Our guests love to gather in the outdoor courtyard, such a rare space in an urban area like NYC. Two kitchens, a dining room and a lounge complement our common areas. They are open from 7 am to 11 pm, in consideration to our good neighbors. FREE WI-FI throughout the entire property. Desktop computers and printer are also available in the lounge for a fee. FREE continental breakfast, served from 8 am to 10 am. You will be welcome to enjoy a variety of bagels, cereal, fresh fruits, coffee, milk and tea. FREE pizza on Wednesday evenings. Our “All You Can Eat” pizza event has been our tradition since our opening. Lockers in the room for your valuables. You need to provide your own padlock (medium-size, thick). Linen and towels (one bath towel per guest) are provided. Luggage storage is available for an additional fee ($4 - $5). Check out is no later than 12 PM NOON. Valid passport is required to check in. This policy is also valid for American and Canadian citizens. NO EXCEPTIONS. All guests must be 18 years old or older to stay with us. Hotel taxes are not included in the rates. NYS, NYC Sales Tax: 14.75%. Occupancy taxes: $3.50 per person per night. These will be added to your balance. Maximum stay in our hostel is 14 nights in any given 30 days. We will not accept consecutive reservations that add up to more than 14 nights. Payment is due full upon arrival. We accept Visa, Mastercard, American Express, Discover, Traveler Checks or Cash. A $10 deposit (cash only) per person is required at check-in and is refundable upon return of keys on time. Beds and rooms are allocated on the arrival day. We will do our best to accommodate you, but we cannot guarantee that a group of 2 or more people will be in the same room. We have a 24hr cancellation policy. Late cancellations, late changes and no-shows shall be charged the equivalent of the first night's accommodation. This was a very easy stay! Walkable, close to the city, friendly staff. Only stayed for one night but would stay again next time I’m in nyc! Spacious, clean rooms with a great breakfast included. The location is really good, as you aren’t too far from anything. Already planning our return! This was my second stay at this great welcoming hostel. Only good words to share about the experience to be greeted by the kind, friendly staff (Luciano, Ana Judith, and everybody else at the breakfast, reception and lodging premises). I will keep on choosing this warm Chelsea place for my. -hopefully- incoming visits to NYC. Thanks for a great time with you all. I would stay again. I enjoy the low key environment and the access to the kitchen facilities. The morning breakfast is enough to get you going as you go out and explore. The rooms are no-frill basic set ups, but clean. My only concern is that the rules of a quiet period between 11:00 pm and 7 am were not enforced. The large group of French people were loud after 11:00 pm for more than one night. Overall, it is a great value for the location. I felt very safe. I really enjoyed my stay at this hostel. The location was perfect! Close to a lot of attractions and metro stations, in a safe and beautiful area. The staff was super nice and helpful, plus, they offer breakfast every morning. I would stay again for sure. Single room in Manhattan for under $100 USD after taxes! It's a steal!. Great location, secure room with ensuite restroom. Simple bed and locker in the room. My only complaint is the lack of hot/warm water in the shower. I chose this hostel due to its location and price. I stayed in a private room with one bed and shared bathroom/toilet. My room is located on the second floor facing 20th street. 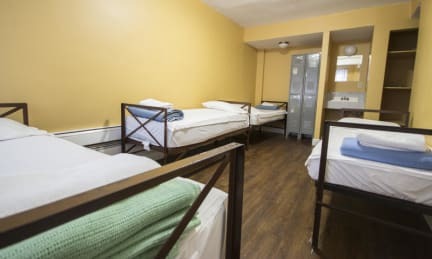 The room was very basic with 2 lockers (BYO lock), sink, a bed, towel, blanket, mirror, trash bin, heater (cannot be adjusted), window blinds, a window that can be opened, shelves to place clothes, and 1 electrical outlet. It gets loud at night from the street noise. Sleep quality was not good. Bathrooms cleaned daily. Staying at hostel was good but the only lavarage keeping this hostel working is its location. They should really start working on friendliness of the staff and making hostel atmosphere a bit more friendly. Excessively pricey for the overall condition.